As the coldest days of the year approaches, many homeowners are wondering how to keep cold air out of a garage, as well as how to prepare a garage for winter in general. 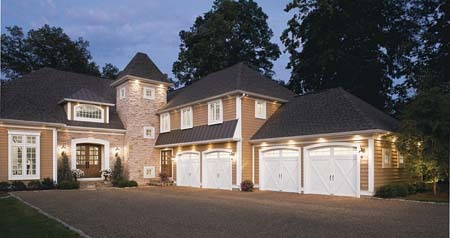 Insulation: Adding insulation to both your garage door and your garage walls is the best way to prepare for winter. There are two ways to go about insulating a garage door. First, you can replace your existing garage door with a more efficient insulated model. Or you can see if your existing door can be retrofitted for insulation. Either way, adding insulation is a great way to prevent the cold from affecting things in your garage and to prevent your indoor heating from having to work overtime. Space Heater: A small gas or electric heating unit can help keep your garage nice and warm through the harshest winter months, and it can also help protect any assets you store in your garage from cold-related damage. There’s also something incredibly nice about getting into your car without needing a parka and gloves. Organization: If you’ve buried your snow blower or shovel, or if the ice melt is in a shed behind your house, move them into accessible spots in your garage so you don’t have to go searching for them when they’re needed. Weather stripping: Weather stripping helps create a barrier between your garage and the great outdoors. But over time, weather stripping can begin to wear and fall apart. When it’s cracked and brittle, it’s no longer doing its job — and it’s time to fix it. If you’re replacing weather stripping, begin by completely removing the existing stripping and its sealant. Then, align the new product by closing the door and making sure the rubber’s flap creates a strong new seal. When you’re wondering how to keep cold air out of a garage, get in touch with the experts at Ole and Lena’s. In addition to our wide range of garage door installation, repair, and maintenance services, we can also help you with questions about insulated garage doors and the difference it can make for your garage.